All writers have those. Especially novelists. And really, a litany of them exist for me. As with books I love, narrowing it down to one is, well, impossible. So, I could list these for days! But not long ago, an event occurred that reminded me of one I so love, so laugh about, that all that needed happen was the memory surface and off again I chased after all the characters. 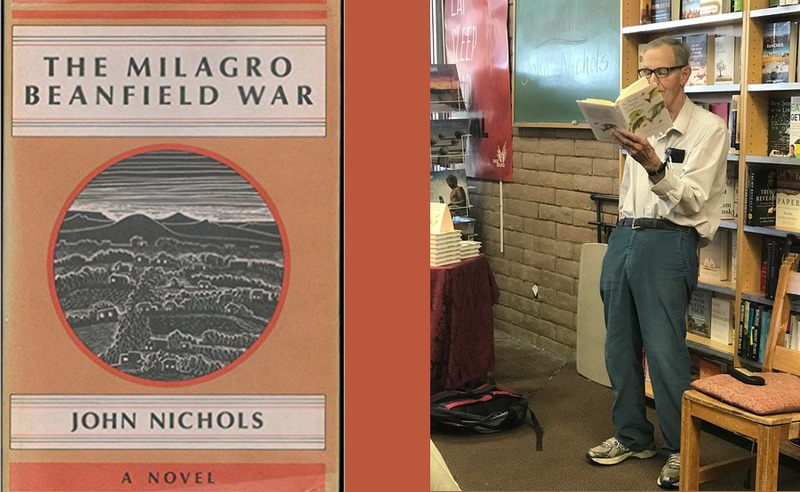 One of my favorite books of all time is The Milagro Beanfield War, by John Nichols. It was famous in its day (as was Nichols himself—Robert Redford made the film of the book. And Nichols also wrote The Sterile Cuckoo), although I have a tough time finding anyone these days who remembers it. Or Nichols. He doesn’t write YA Dystopian. Or vampires. Or werewolves. Or, well, he’s not genre. You know—he doesn’t write the schlocky stuff that sells these days. He writes (from the ‘60s until today) great books that have substance and meaning and that yeah, you actually have to work for a bit. When I was getting the link for this, I read a lot of reviews that labeled the beanfield book slow and boring. Yep, nothing is blowing up on page one . . . But I’ll never forget decades ago when a good friend loaned me the book and I read it the first time (lord knows how many times I’ve read it since), and I started laughing out loud from the first page. I loved all the characters from the town—from Joe Mondragon, who one day illegally irrigated his beans, to of course, Cleofes Apodaca, the Patron Saint Crazy of Milagro, whom everybody claimed had El Ojo, the “evil eye,” and gets blamed for everything from the plants in somebody’s garden withering to a farmer saying he was responsible for his flock of six two-headed lambs in one springtime. I love the entire huge cast of characters in between. But it was Amarante Cordova, who all his life “lived in the shadow of his own death,” and who just wouldn’t die, who formed the moral (if irreverently hilarious) compass of the book. A richer character in literature I have a hard time finding. He’s the symbol of what the whole thing meant. And all novelists wish to encapsulate that with our books. When I was in Albuquerque and Taos recently, Nichols was having a book signing for his newest, The Annual Big Arsenic Fishing Contest! So of course we went. Now, full disclosure—I’ve known Nichols for decades. But I met him after I loved Jose’s Beanfield, so this isn’t shameless promotion for a friend! He may be the funniest writer alive. One of the most irreverent, for sure. But housed under all of that is a beautiful compassion, a sense of wonder, unabashed joy. And attention to what makes us all human, and what could sure salvage us today. Under the sheer delight of ridiculousness always resides in his stories the sublime. Nichols is still, well, Nichols. Funny, irreverent, crazy to the core. And delighted to see us. Amazed, actually, that I’d come from Texas to his book signing. He read from the new novel, which had us all laughing out loud. I read it on the plane ride home—beautiful, hilarious, insightful. Vintage Nichols. I’ve read everything he’s written (fiction and nonfiction), because, well, he could write the yellow pages and make it humorous. But The Milagro Beanfield War will always be my favorite. I can’t even think about it without laughing. Much less think about Joe Mondragon’s best friend, Amarante Cordova. Cursing everybody into enlightenment. Cursing the rheumatic Coyote Angel. But always hitting the heart of the matter. And oddly, supplying courage when everybody (from Joe to me and everyone in between) thinks perhaps this very cliff is one we shouldn’t jump off. Too steep. Too tough. Too impossible. So yep, I wish I’da created old wheezing Amarante. Wish I’da written the entire book. But so glad I have my old buddy John Nichols still writing this stuff! Thank all the gods someone still is. Neat post, Susan. Old, favorite books are such treasures. “The Silver Chalice” was one of my early favs. My mom found it for me at a yard sale! I just loved the author’s (Thomas Costain) way of weaving a story from such a distant time and of course, the characters. I was in Oregon about a month ago, and stepped into a used book store. On the shelf was another of Costain’s old, worn hardbacks: “The Black Rose.” I’m reading it now and loving it. Aren’t they, Colleen! And the synchronicity of you stepping into a used book store and finding another of Costain’s gave me chills! What a great review – I feel that I must go out and read this book immediately! I love a good book with colorful and wise characters. To write that type of book – that capture the joy and mystery of life – is an all too rare gift, indeed. Nichols excels at that, Reba! So wise, so insightful. And so hilariously funny. Today of all days, I wish the whole world would read him . . .
Wow what a great post. I would love to read this. I may have to pick it up! It’s a great book, Neely! It’s great when you find a writer whose style sticks with you over the years. I don’t believe I have read any of his books. He’s a great author to get to know! What a lovely tribute to author and your friend, John Nicols! I haven’t read the book but do remember the movie well, Susan. It’s lovely to have such a deep connection to his writing and his characters and to feel the same about “The Milagro Beanfield War” even after all these years. I’m putting it on my list of ‘must-reads’ and thank you for the review. I think you especially, Beverley, will love the theme and sentiments of this book. Plus, Nichols is such a hoot! This book has gone to the top of my ‘must read’ list thanks to your great review, Susan. Favourite characters and the books they feature in are like wonderful old friends – go to places when you need a break from the real world. Wonderful that you became friends with an author you so admire. So true, Tamuria–characters and books are like wonderful old friends! Every time I pick this one up, I just laugh out loud! It’s awesome when you can relate the characters in a novel. I love when that happens. Isn’t that just wonderful, Sabrina! You sold me. I’m going to look into this book! Looks like a great read! It is a great read! Enjoy! What a great post because it’s true we wouldn’t do anything if we let fear run our life. Thank You. I love to read, and I keep a (very long) running list of titles I run across that would be nice to sit down with someday. I may have to add this to the list! Thanks for the introduction! I do the same, Jennifer. So many books and so little time! Treasured books are really adventures you can live over and over again. Love this and so cool you’ve even gotten to know your favorite author! Isn’t it wonderful to live them over and over, Julie! The name John Nichols sticks a bell somewhere in my mind–I know I didn’t read this one but from the way you describe it I definitely know I would love it. I’m one of those rare readers who has no problems crossing genres! I will definitely be putting this on my TBR list! Love to hear that you cross genres, Michele! Enjoy this one! What a wonderful review, Susan. I’m going to have to see if I can find this book at my favorite bookshop. I’ve known the owner since we were very young and before she took over the family business and if anyone can find me a book, it’s her. So I well understand your loving your friend’s book – you are so lucky! Oh, Vatsala–I love that you know personally the owners of your fav bookshop! Bless them, and you! It’s lovely to hear you describe your passion and admiration for these characters and authors. Oh, I do so love characters and books and the authors who create them! thanks so much for sharing this. I am an avid and discriminating reader but honestly have not heard of Nichols. Your description of his characters is enticing. I will get the book and read it. Thanks! Not many folks I talk to have heard of him, Alene. And he’s genius! I’ve never read of his books, but when I do find an author I like, I have to read all of his or her book in the order that they wrote them. I do that too, Lisa–isn’t it so much fun! You find an author who resonates with you, and read all of the books. Just love that! Your review is pretty interesting and this definitely sounds like a great book to read. Honestly John Nicols is new for me, but I would definitely love to have a go at this book right away! This is a great review. It’s amazing how connected you can feel to multifaceted characters and an engaging plot. Isn’t it though! Ah, great characters in the skilled hands of a master writer. That just does it for me! You leave me saddened that I haven’t read The Milagro Beanfield War. At the same time, you’ve ignited remembrances of characters that I fell in love with. I don’t remember when I exactly stopped reading fiction. but I think it’s time to start again. Thanks Susan. Oh, Joyce, yes it is! Fiction is the key to unlocking the profound wonders of the soul . . . I love reading all types of books depending on the mood I am in. Sometimes I like an easy read that I can breeze through and sometimes I like a heavier more difficult read. I love finding old books that have a complete different feel from the books of today. I will definitely look into this author. I do the same, Carrie. Although I read mostly Literary, sometimes I need something light and funny. And I’m with you–don’t old books just have a different feel! Loved the book The Milagro Beanfield War. I read it many years ago. As an author, I really understand the attraction to a character. Thanks for sharing! Isn’t it just marvelous, Candess! Love, love, love this book! I’ve never read the book or seen the movie, but now I’m thinking I should. Great piece! Awesome review and now I need to go out and get it myself to see exactly what you are talking about lol 🙂 Thanks for sharing your wonderful post and how much you enjoyed reading this book! Passed this on to my two longest/oldest BFF, one who is an editor & published poet. We meet monthly & they often pass along books to read. My taste & theirs is different & I wanted to give them a classy recommendation.